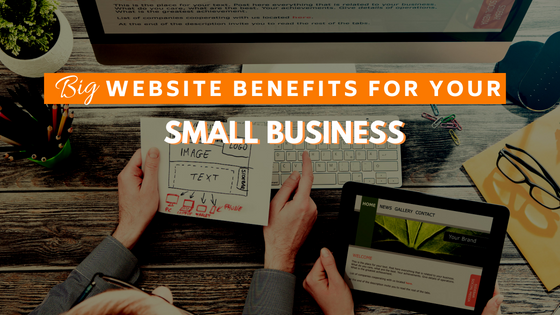 Are you an owner of a small business and still don’t have a website? Probably it’s because you don’t know the benefits a website can bring and how easy is to have one. In a recent survey, almost a half of small businesses (made up of 1-5 people) said they don’t have a website. The reason? Some of the owners said because it’s expensive, others said they don’t have the time or the knowledge, and many others said that their businesses were too small to need a website. The fact is that every business, no matter its size, needs a professional and easy-to-maintain website to showcase their products or services and to deliver information to their audience. Building a website for your small business can be easy, affordable and does not require technical skills. Some people even think it’s enough to have a Facebook page. As with most free online services, Facebook is attractive to small business owners because it’s quick, easy and free, but a website and social media channels have different roles. It is, however, noteworthy that both are important in building your brand. Social media must be seen as part of your online strategy, but not your only tool. Having a Facebook page is a good way to reach your audience, but its main objective should be to drive that audience to your website, where prospect clients can take actions like shopping or filling out a form. Your website is where people will know more about your business, and in this way you can start building trust with customers who are hearing about you for the first time. Actually, a study performed by Verisign reported that 84% consumers believe that small businesses with websites are more credible than the ones that doesn’t have one. Another advantage of having a business website is that it gives you complete control over your entire media brand. You can have any design you want and showcase your products or services 24/7 in a beautiful design that matches your branding identity and colors. While in Facebook you can add your logo and make minor changes in how information appears, but you’re still at the mercy of Facebook’s look. A website is a powerful sales tool and the best way for your potential clients to find you. The same study by Verisign reported that 90% of consumers search on the internet to evaluate local goods and services and if you don’t have a website for your business, the chances of showing up on the search engine results page are zero. Do you need a website for your small business? We can help you! Contact us and we can give you an estimate without obligation. There’s nothing you can loose. In Treefrog Digital we offer affordable plans to fit your small business needs and budget.